Flipped classroom setup. Photo by author. Not every history student is going to become a professional historian. The challenge, therefore, is an obvious one: how can professors transcend traditional pedagogical models that emphasize written exams and research papers to incorporate elements that better prepare students for life after an undergraduate degree? Some individuals teaching Canadian history are especially interested in reinventing the traditional lecture teaching style for a hybrid model that explores digital history, experiential/active learning, inquiry/problem-based learning, and public history. Through collaborations with other scholars, as well as partners in other departments or faculties, Canadian history professors have the opportunity to transform the way students interact and learn in university classrooms. Many history graduates have found themselves in jobs for which their research and analytical skills are important factors in their success. To get into these positions, applicants encounter employment competitions that force them outside of their comfort zones and challenge their creative thinking skills. How can we expect our history program alumni to innovate in the workplace if their post-secondary education employed pedagogical models that were pioneered before the arrival of the digital age? Employers are looking for skills and experience that are often overlooked by traditionally structured history departments. Moreover, the contemporary employment landscape is increasingly collaborative while academic history training rarely requires meaningful collaboration. Consequently, recent graduates often lack the practical experience of conducting media scans, summarizing complex ideas, or writing clear and concise summaries. While it is true that Canadian history departments encourage undergraduate research, how many of them have integrated real-world scenarios into their classrooms? Canadian history can offer students the opportunity to engage in problem-based learning in an active and experiential learning environment. The authors of this post have collaborated to reimagine learning within the scope of a third-year Canadian international relations course. In addition to a final exam and research paper, we envision that students participate in in-class exercises that require them to write a briefing note in an allotted amount of time. For example, in one scenario students engage with primary sources from the 1956 Suez Crisis, in the days following Egypt’s nationalization of the Suez Canal and the incursion of Israeli, French, and British forces into the region. Student teams are given two hours to digest radio broadcasts, television clips, and a selection of Department of External Affairs (DEXA) documents written following Israel’s invasion of Egypt on 29 October 1956. They are tasked with drafting a briefing memo to Canada’s Minister of External Affairs Lester Pearson before the November 1956 vote that created a United Nations Emergency Force, imposed a ceasefire, and kept the peace. They are expected to produce the various courses of action Pearson could pursue, including their one recommended option, in order for Canada to deescalate or resolve the situation from its own perspective. Students are graded by their ability to understand the context of the event, the potential choices for action (or inaction) and their consequences, as well as the rationale for their final recommendation to the Minister. Completing this scenario in two hours is difficult, but it is a professional group-based task that some students will find themselves in following graduation. Many Canadian history scholars have either privately gathered or published collections of primary documents that offer tantalizing scenarios for students to grapple with. Though the Suez scenario is more of a crisis situation, professors could elect to use any setting involving political parties, federal elections, labour actions, or any other historical topic. This exercise is particularly suitable to introduce students to the complex nature of Canada’s history with Indigenous peoples and northern development. For example, the Centre on Foreign Policy and Federalism’s Documents on Canadian Arctic Sovereignty and Security (DCASS) series has released ten volumes of primary documents that are open-access and readily accessible. For those interested in Canadian external affairs, the Documents on Canadian External Relations series has over twenty-seven volumes of primary document collections. Scholars can also find audio-visual sources within the Canadian Broadcasting Corporation’s Digital Archives. Institutions that have endeavoured to be technologically and pedagogically innovative are, perhaps, best positioned to offer students an immersive experience for these scenarios. Using a flipped learning approach allows instructors to engage students in more meaningful discussion and facilitate deep learning during class time. Introducing collaborative technology into a flipped environment can enhance student-to-student, and student-to-instructor collaboration, as well as improve student engagement. Rather than replacing in-person collaboration with strictly virtual environments, collaborative classroom technology allows students to search for, create, edit, share, and publish content on different media platforms, while instructors act as a guide on the side and facilitator. 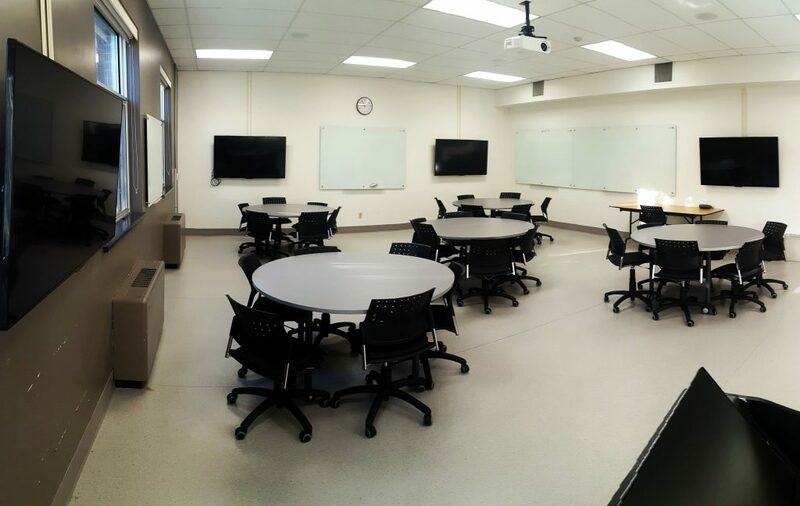 For example, instructors at St. Jerome’s University, a college of the University of Waterloo, have access to smart classrooms embedded in the library. The classrooms are variants of the SCALE-UP (Student-Centred Active Learning Environment – with Upside down Pedagogies) model of active learning classrooms. These collaborative, active learning environments offer an ideal platform for problem-based learning. The rooms consist of large, round tables to facilitate group work, virtual collaboration and screen sharing to enhance information gathering and sharing, and writable surfaces to aid in ideation and problem solving. The technology in the room allows professors to deliver audio, video, and image content to students, or allow for each student group’s content to be shared with the rest of the class. In this particular exercise, the technology facilitates a “live” broadcast of archived radio or television content to initiate a research and analysis scenario. In the case of the Suez Crisis assignment, students are limited to primary sources including: international newspapers, press briefings, and parliamentary records which are readily accessible through library subscriptions or open access. The smart classroom could be used to restrict access to outside digital content and limit students to a carefully curated selection of primary materials. Rather than searching out secondary sources and synthesizing scholarly opinion, the students must rely on their own creativity and problem-solving skills. In other words, it forces students to think for themselves by creating a problem where the answer must be developed from independent analysis through engagement with the primary materials. An additional benefit of this model is the element of professionalism or experiential learning embedded in the students’ content learning. The intensive team-based work requires additional communication, leadership, and followership (yes, it’s a thing) that students can expect to encounter when they reach an increasingly collaborative workplace. History undergraduate students are not often introduced to this until they enter the workforce. To be successful, students must organize their team, delegate certain research tasks, complete their individual assignments, clearly communicate their findings to their teammates, form a cohesive argument in order for their team to be successful, and write a clear and concise memo for the Minister. This team-based approach does not easily allow individuals to avoid making a contribution. Rather, it provides a platform to safely push students beyond their normal comfort zones. Professors and their institutional partners must infuse course content with additional learning opportunities to prepare students for success with experiential and problem-based learning. Providing the class with enough historical context and background information is a vital first step. A workshop introducing students to writing briefing notes ensures the mechanics of the process. By the end, students submit their drafted briefing notes and receive feedback from the professor. In addition, a second workshop on the effective use of primary sources, co-facilitated between librarian or archivist and professor, rounds out skills the students need to complete the task. In other words, professors must introduce students to the process of employing research and analysis skills in alternative settings, through hands-on exercises. Historians must innovate their teaching philosophies to adapt to the digital age and prepare students for life outside of the academy. Many historians, librarians, and archivists have already begun to normalize the digitization of archives, the creation of primary document databases, and the release of digital open-access e-books, among many other ways that we collect, organize, and share our ideas. The briefing note scenario shared in this post encourages professors to collaborate within their institutions, to share and utilize their primary document collections in ways outside the confines of traditional research, and to expose students to a problem-based and experiential learning environment that tests their research and analysis skills in real-life settings. By modernizing the traditional lecture-based teaching model through the incorporation and employment of digital sources, we will attract more students and better prepare them for employment. Thirstan Falconer is a Post-Doctoral Fellow with the Centre on Foreign Policy and Federalism at St. Jerome’s University. His research examines the efforts of mainstream political parties to engage with and appeal to ethnocultural communities during the 1960s and 1970s. He is also interested in examining how these relationships led to an “invention” of ethnicity. Zack MacDonald is a Librarian at St. Jerome’s University, where his current work looks at the relationship between instructional design and learning space design, and student engagement and learning outcomes. He is also the Digital Librarian for the Medieval D.R.A.G.E.N. Lab at St. Jerome’s University, where his current research explores the use of GIS and 3D modelling as a means to reconstruct medieval human and natural landscapes. In 1980 twenty percent of professional work was collaborative. By 2010 that trend in the professional workforce had reversed to eighty percent [Marc Hurwitz, Samantha Hurwitz, Leadership is Half the Story: A Fresh Look at Followership, Leadership, and Collaboration, (Rotman – UTP Publishing, 2015)]. and Pennock, A. (2011). The case for using policy writing in undergraduate political science. PS: Political Science and Politics, 44 (1), 141-146.